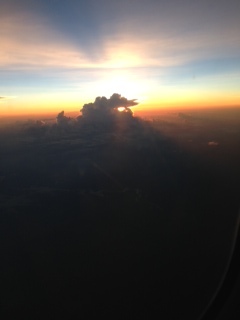 Above the clouds, sitting in a tight airplane seat, I sense God close. Is it because his angels fly on the wings guiding us safely back to solid ground? Is it because my child’s heart still thinks heaven lives in the skies? Is it being untethered to the earth? Could it be the stillness and quiet I enfold myself in when ensconced inside a steel bird? Is it the praise music that fills my headphones singly directly to my heart only? Whatever it is that hugs him to me, I welcome the embrace. Tonight, I say a prayer of gratitude for the work I do that brings me into the orbit of people who care, with genuine mission and strength. They let their hearts serve those who need their talent and compassion. There is no glory in their work. There is no great financial reward. They are not heaped on with gratitude and recognition. They are called by something greater than themselves. Their caring souls make my heartbeats smile. They reflect the face of God. I have spent a week in their presence, soaking up their effervescent spirits. While I am dog tired, I am rekindled with a sustainable energy that makes my weariness feather light and assures me it is transitory. I say a quietly loud thank you for people like them who walk the heart of Jesus in our messy world. As I watch the sun set on top of the clouds, melting into a softness, it transforms the clouds into a brilliant thank you for yet another day. Day leaning into Gods tender love. This journey has wrapped its heart around my own and I know I am blessed beyond any words I can speak. I think of the love of a man and puppy that waits for me on the other side of today and this week. A silent but loud thanks to God who knows my heart better than I do for this extraordinary life he has gifted me. So, so blessed. Here is the question this has stirred in me. How do you walk the heart of Jesus? I am going to try and let this question lead my days that I hope to end with a soft melting into God and a brilliant thank you to match the sunset. Dear God, Help us to take a moment to say a little prayer every day to thank all those who walk the heart of Jesus. Pray that their hearts remain open even when their hard work is not acknowledged or given gratitude. We ask that you continue to give them the strength to do the hard work of caring much. Last, thank you for this day and all I have seen and known today as well as all the blessings in my life. With a grateful heart, Amen. 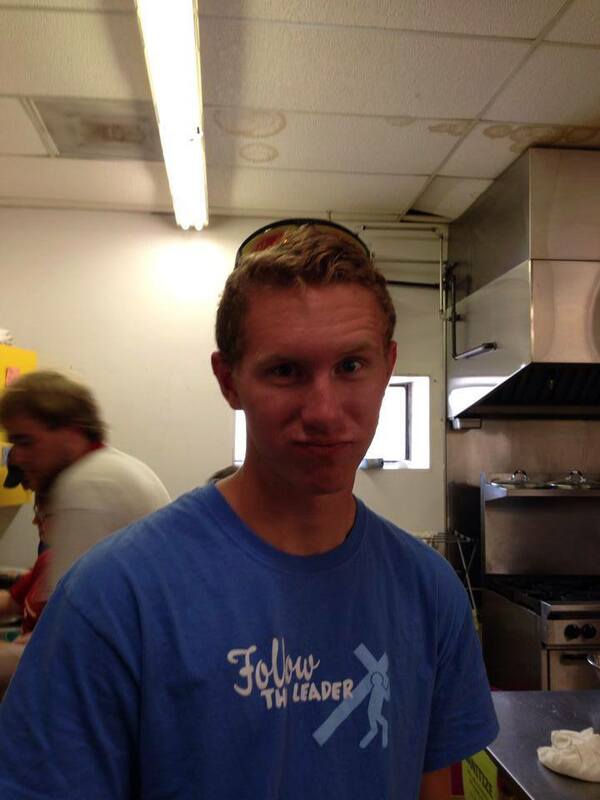 Adam Pugh in the kitchen on a mission trip to Montana. Hello my name is Adam Pugh, I am going to be a senior and I went on a youth works mission trip to Lame Deer, Montana which is on the Northern Cheyenne reservation. One of the things we did in Montana was Kids Club. It is like an all summer vacation bible school for the kids in the community that we help at. I found out that kids loved getting underdogs from me because I am so tall. One of the days we were there a little girl came and sat down at one of the open swings. It took me a moment to recognize her. But I soon realized that it was Asia, the girl the YouthWorks staff had said was deaf and could not communicate very well. So not knowing if she wanted to be pushed or not and not knowing how to ask her I just kept pushing the other kids. Then one of the times she caught my attention and pointed at someone who had just been pushed. Cautiously, I went behind her and gave her a little push and I got a little hint of a smile in return. So I went back and gave her a full underdog, turned around, and saw her laughing and smiling while the swing soared through the air. It wasn’t until later while I was reflecting on the day that I realized how God was in that moment. It was in the way she communicated, it was in the underdog, and it was in her smile. Because like Asia, God doesn’t just come right out and say what He needs to say, He does it with a little point and a smile and we are the ones that need to put it together to make the push. So I would like to thank the congregation for all of your support and prayers to send so many of us on mission trips this year. It certainly makes a difference in the community, and in all of our personal growth toward God. Let us pray … God thank you for the promise that you are always with us, watching over us constantly. You are Immanuel (God with us); your presence enfolds us in radiant Love. Nothing, including the brightest blessing and the darkest trials, can separate us from You. Help us seek you all the time in everything. Help us to see you in the beauty of this world and to know that all things wonderful are from God. Beyond your wildest dream, God is holy! Hackenberg, Rachel (2011-03-30). Writing to God: 40 Days of Praying with My Pen (p. 35). Paraclete Press. Kindle Edition. thank you for words that draw pictures in my mind … pictures of the many colorful images in nature, the blue skies, cloudy grays, green leaves, red rocks towering in Monument Valley over the vast high desert plain. Help me, Lord, when the fog closes in and I cannot see the painted canvas you are creating. Help me, Holy Spirit, to truss that you are leading us always — help me to hear your voice and sense your presence, even in the foggy days. The vet pulling the O2 tank behind him. The women in line at the food shelf. For when we look into their eyes we see your face. Holy, Holy, Holy are you oh God. You are Savior, friend, Redeemer, Lora and so much more. You are full of grace, beauty, majesty, and love. Let the whole earth sing songs of praise to you oh glorious God. How good it is to sit at your feet. I humbly come before you, ashamed and embarrassed for my sins. My sin of busyness. My sin of pride. Thank you for cleansing me of these sins and all my others, for your name’s sake. I come to you in reverence and adoration. Not because I deserve you. Quite the contrary in fact. Rather I come in response to your loving arms wide open ready to receive and love me just as I am. In Jesus’ name. As if we need proof. on Mikey, as he helps boys grieve and navigate the horror of two deaths in a weekend. on caregivers like Daddy’s doctor, caring for his eye. on the servers at Perkins, so full of grave love and service. on Mom and Michelle, whether they know it or not. I can feel them. And I am grateful. Thank you Lord for your abundance of beauty and love. As your beauty flows from you, it is exemplified throughout all the people and things that you have surrounded us with. Whether it be a cold snowy, Minneapolis morning, or a warm beautiful day at a lake, thank you for the showering of blessing you always drench us with. bless us all with a whole vie of your generosity and love. And you hand to me more of my wants than I deserve. I love to see you all around me. Loving God I cannot thank you enough. Imago dei – thank you! You are an artist of creation. And you make all things new everyday. Help us to remember that in creation you are always doing a new thing, and it is good and pleasing and perfect. Oh God, that we, your people, can also be good and pleasing and perfect! Open us to your love and light and creative work that we might, every day, be more like you … Imago dei. Thank you for the wondrous world that reminds us how beautiful you are. I see you as I pass through the halls. I see you in deeds and daily activities. In the beauty you pour into souls. helping to create even more beauty. I see you God, as I walk outside. In all of your creation. you hold me up to see this beauty. Holy, Holy, Holy God creator, You are in everything and are everywhere. You’re presence is felt in the people around us. Your glory shines in the light, surrounds us in the fog and comforts us in the darkness. Blessed Holy Father thank you for surrounding us with such love and guiding us in all that we do. Your fingerprints are everywhere. Author note: Sarah Barber is a member of the Spiritual Life Team (SLT) at Easter. Her other involvement at Easter includes helping Hans with Youth Group activities, leading summer mission trips, attending Monday evening Chick Talk and Worship Committee. Sarah had the amazing opportunity to travel to Guatemala at the beginning of October with 10 other women from Easter forming the first all women delegation to our sister synod, congregation, and school. Outside of Easter Sarah is involved with Southern Minnesota Teens Encounter Christ ministry and works as a pharmacy informatics analyst at Children’s Hospitals and Clinics.